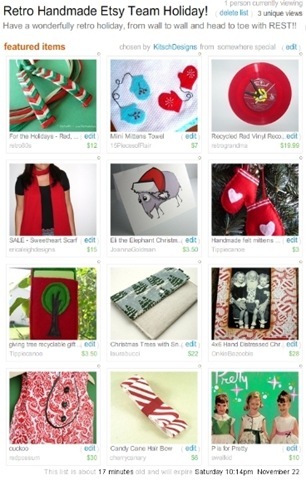 I am a member of the Retro Handmade Etsy Street Team and we have been working on putting together a holiday theme Treasury on Etsy. I have never even tried to get a Treasury or put one together, but today I just happened to notice the total number was getting low. I just watched the number come down for a few minutes and was able to score a spot for us- I could not believe it! Now, I would have loved to fill each and every spot with my own products and shamelessly plug my wares, but I was good and I put together something that I think represents our team pretty well. Check it out and if you feel so inclined, buy some nice handmade retro inspired treasures for your holiday gifts this year! Click Here to View and Shop!